Maa Kali is worshiped primarily in the capital of Bengal.Kolkata is the capital city of West Bengal. This city was formerly known as Calcutta which has been the cultural center of our country since the British era. Kali Maa is worshiped primarily in the Capital of Bengal Kolkata is the capital city of West Bengal. This city was formerly known as Calcutta, which has been the cultural center of our country since the British era. Maa Kali is worshiped primarily in the capital of Bengal, Kolkata. 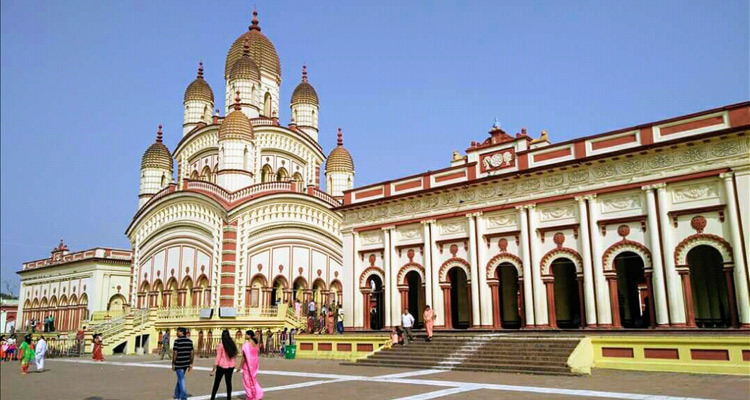 Here, the largest temple of Mata Kali is famous as the Dakshineswar Kali Temple. Many people believe that Kali himself resides in Calcutta and named after this place was Kolkata. It is located near the monastery along the Hoogly River. Should be relieved by scorching heat. So arrive immediately. The beautiful hill station of North India This Kali temple is considered to be one of the 51 Shakti Peeths. It is said that there were four fingers on the right foot of Maa Sati falling on this place. In this temple, Goddess Kali's idol is linen with blood and the goddess is wearing garlands of Naramundo. It is said that sometimes Sri Ramakrishna Paramahansa was a priest. Here thousands of pilgrims from abroad come to visit this Kali Temple. It is said thatMaa Kali aarti had gifted visually in this temple to Ramakrishna Paramahansa. Paramahansa Dev's room is on the temple premises. In which his bed and his memento are kept in his memory. The Dakshineswar temple is made for Goddess Kali only. 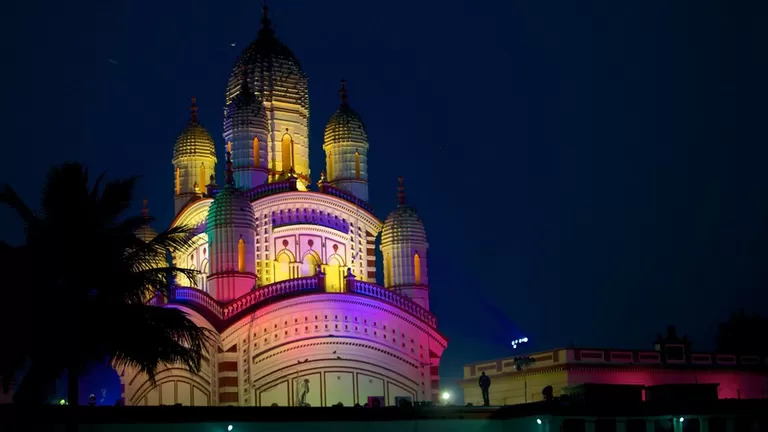 Dakshineshwar is the main temple of Kali. It is said that Kalima herself had spoken of making this temple by dreaming of the widow Rasmani, the widow of Shudra Zamindar. It is said that there is a queen named Rasamani at one time. Rasamani was a great devotee of Kali. The Queen used to go to the sea to worship in the Kali temple of Kashi. Once the Queen was preparing to go to the temple of Maa Kali with her relatives and servants. At that time, Queen Kali, appearing in the dream, ordered the Queen to build a Maa's temple and serve her at this place. On the orders of Mata Kali, Rasamani Rani started building a temple here in 1847, which was completed by the year 1855. This temple of Kolkata's famous and jagratha Dakshineswar has been a great shrine of Kolkata for many years. The priest in this temple was also afraid to keep legs. Staying here due to the old caste system of the Hindus and the elite custom of Bengal was considered very risky at that time. Temple of Kali Mata is built like Navaratna and it is 46 feet wide and 100 feet high. In the inner part of the temple, the lotus flower made of silver, which has thousands of petals, but the Maa is standing on Lord Shiva with black arms.Ganga flows near the temple Ganga River near this temple, the river Ganga which flowed through the Hooghly river in Bengal. There is 12 dome in this temple. This temple is situated on green, ground. 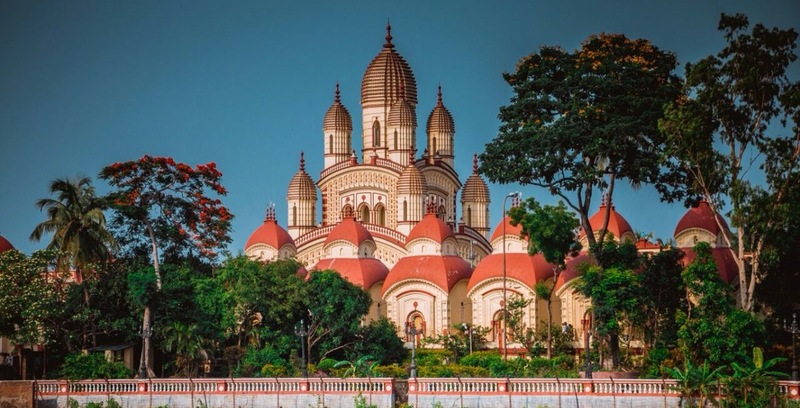 Twelve temples of Lord Shiva have been established around this huge temple.Ramkrishna Paramahansa in Dakshineswar temple - Famous thinker Ramkrishna Paramahansa had received the spiritual vision of Goddess in the temple of Mata Kali and he had given a discourse for religious unity on this site. Ramkrishna was the priest of this temple and lived in the temple. The doors of his chamber were always open to the visitors. This temple situated on the south side is three-story. The nine domes are spread evenly on the two floors above. Beautiful shapes have been made on the terrace of the domes. On the inner side of the temple, Dakshina Maa Kali is standing on Lord Shiva. Devotees sit and worship around the holy place where the statue of Goddess is kept. 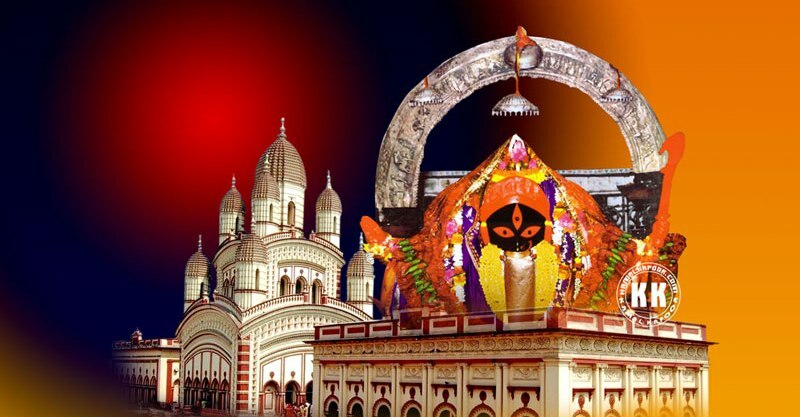 The world is famous Dakshineshwar Maa Kali Temple - The temple of Dakshineshwar Mata Kali is the most famous in the world. Maa Kali's temple is considered to be the oldest in the cultural religious pilgrimage sites of India. Airplane Service Kolkata is connected to all major cities, including Bangalore, Mumbai, Delhi, Chennai via Air Services. railroad track There are two main stations in Kolkata- Sealdah and Howrah Kolkata is also connected to all major big cities through the railroad.Every major city can be visited from Kolkata. Taxi from the meter runs in the local instrument, Lucka. Bus, Metro Rail, Bicycle Rickshaw and auto rickshaws run.